Over the last 10 years, Fresno County farmers have reported increasing raisin moth populations in organic raisin vineyards. Addressing this concern, Kent Daane, UC Cooperative Extension specialist in the Department of Environmental Science, Policy and Management at UC Berkeley, will update growers on the pest’s biology, management and damage at the San Joaquin Valley Grape Symposium Jan. 8 in Easton. Daane and his research associates followed moth populations in organic and conventional fields to document this observed change and determine if there were any specific causes for increases in raisin moth densities. 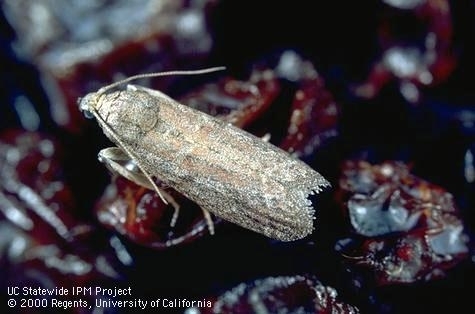 In a 2013 season study, UC Kearney Agricultural Research and Extension Center entomologists found that spring to early summer pheromone trap catches of raisin moths were prevalent across numerous vineyards, regardless of management practices. However, overall seasonal damage in 2013 was low. The symposium begins with registration at 7 a.m. and concludes following lunch at 1 p.m. at the C.P.D.E.S. Hall, 172 W. Jefferson Ave., Easton, Calif. Registration is $15 in advance and includes lunch. Registration at the door is $20. To preregister, send the names of attendees and a check payable to UC Regents for $15 each to San Joaquin Valley Grape Symposium, 550 E. Shaw Ave., Suite 210-B, Fresno, CA 93710. To register with a credit card, fill out the online registration form at http://ucanr.edu/sjv2014. 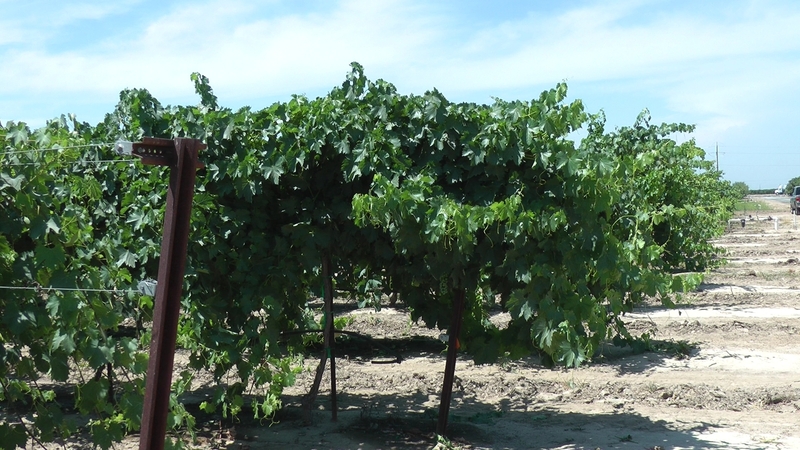 Employees from Constellation Brands, a vintner working closely with Kearney viticulture specialist Matthew Fidelibus, bought sample wines to Kearney today to compare with the corresponding grapes growing on the research vines. To read more about the research, see Vintner creates interesting new wines from research grapes. Constellation Brands staff, from left, Dan Bosch, Owen Taylor and John Holmquist. Matthew Fidelibus speaks at mid-summer wine tasting. If a superb winegrape cultivar adapted to warm temperatures emerges from a research trial at the UC Kearney Agricultural Research and Extension Center, the state’s premiere agricultural region may be able to establish a reputation for growing fine wines. 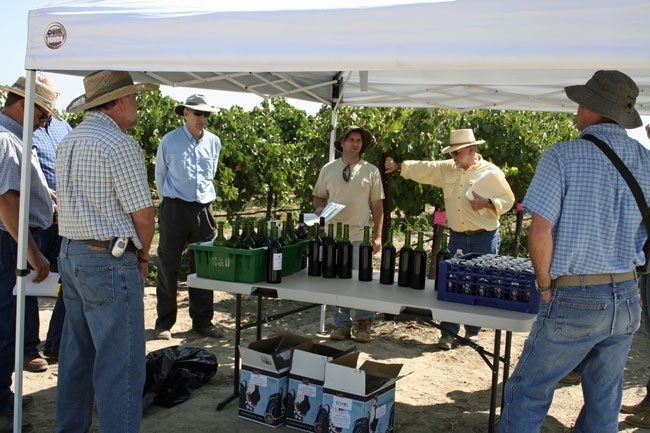 For this reason, UC Cooperative Extension specialists in the Department of Viticulture and Enology at UC Davis have teamed up with winemakers from Constellation Brands to identify a wine variety that excites the palette and flourishes in the San Joaquin Valley’s hot climate. At the outset, the researchers were searching for blending varieties that would make San Joaquin Valley wines with familiar names more interesting. Vintners may use up to 25 percent of the grape volume to impart distinctive color, flavor, and structure to a varietal wine without calling it a blend. The winegrapes being studied at Kearney, the researchers believed, could add a certain flavor note or deep color to a San Joaquin Valley Merlot, Cabernet Sauvignon, or Chardonnay. Moreover, changing demographics may present opportunities for new varietal wines, especially for the newest generation of potential wine drinkers, the generation known as “millennials,” only about half of whom have turned 21. Currently, 80 percent of California wine is made from fewer than 10 types of winegrapes. Most of the popular wine varieties in California – among them merlot, cabernet sauvignon and chardonnay – are at their best in somewhat cooler climates. The researchers are looking for grapes that make superior fruit in warm climates. The unsuitability of California’s most popular winegrape cultivars to the Central Valley’s climate is reflected clearly in industry statistics. The San Joaquin Valley is California’s largest grape growing district in terms of production, but lowest in terms of price. According to the California Department of Food and Agriculture 2011 Grape Crush Report, District 13 – which includes the counties of Madera, Fresno, Alpine, Mono, and Inyo; and parts of Kings and Tulare counties – had the largest share of the state’s crush, at 1,495,027 tons. District 13’s average price per ton in 2011 was $324.26. In contrast, the value of the crush in District 4 – Napa County – was $3,258.88 per ton. Matthew Fidelibus, UC Cooperative Extension specialist in the Department of Viticulture and Enology at UC Davis, attributes the 10-fold price differential in part to the impact of weather on particular winegrape varieties. In grape varieties adapted to a cooler climate, some biological pathways are stifled at elevated temperatures. As a result, some important flavor compounds develop out of sync with sugar accumulation, and the grapes may not attain their potential flavor peak before it is time to harvest. Anthocyanins, for example, give red wines their characteristic deep scarlet to purple color, but high temperatures suppress anthocyanin accumulation in some varieties. To find new varieties suitable for warm, dry weather, the scientists turned to Foundation Plant Services (FPS) at UC Davis, which manages the National Grapevine Importation Program, the largest program for importing grape selections into the U.S.
FPS enables grape growers, nurseries, researchers, and wineries to bring valuable new selections into the U.S. without the threat of importing foreign exotic pests and diseases that could cause serious damage to the industry. From 1995 through 2006, over 640 new selections were imported. 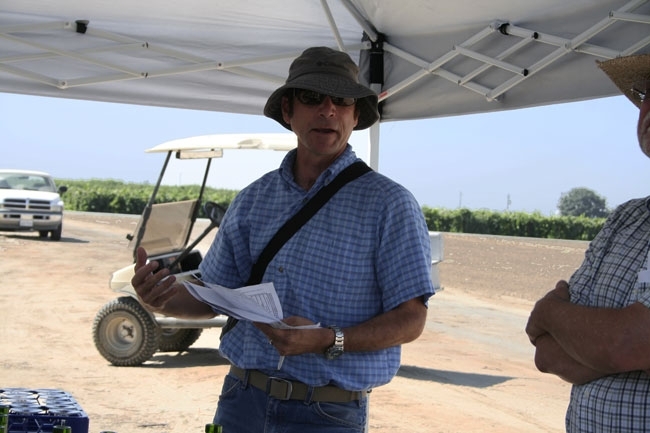 Wolpert, the Kearney project’s initial principal investigator, selected 55 winegrape cultivars from Spain, Greece, Italy, and other areas where the climate is similar to the San Joaquin Valley’s. It used to take 15 years to bring in new varieties,” Wolpert recalls. “FPS got that down to five. They have stuffed the pipeline full of interesting grapes, some you cannot find on the East Coast (of the U.S.). The varieties chosen for the project are not exactly “new,” Wolpert clarified. Some are 1,000 years old, but are new to California. Fidelibus, now the principal investigator on the grape production side, is gathering data on each variety’s yield potential, cluster architecture, amenability to mechanization, and other viticultural characteristics. The research vineyard contains 50 vines of each variety on 1103P rootstock. The rootstock was planted in 2008 and was budded to 55 varieties in spring 2009 with some re-budding in 2010. Vines were trained to bilateral cordons on trellises with a cordon wire 48 inches above the soil surface, and two foliar catch wires on a 10-inch wide cross arm, about 15 inches above the foliage catch wire. Vines were drip-irrigated, at about 60 percent ETc, and spur-pruned with approximately 15 shoots per meter of cordon. They were allowed to retain their entire crop, which ranged from 2.3 to 33 kg of fruit/vine, depending on the variety. Constellation Brands winemaking personnel are monitoring the winegrapes’ potential to produce distinctive, flavorful California wines. Of the 55 Old World winegrape varieties planted in the 1.4-acre plot at Kearney, about half displayed enough promising characteristics in 2011 to prompt Constellation Brands to make 25 small (10-gallon) lots of wine from 150 to 200 lbs of grapes. "In 2008, we picked all red varieties at 24o Brix," recalls Kaye. "In 2011, we picked red varieties at 24o Brix and white varieties at 22o Brix." From the winemakers’ standpoint, the next great California wines will need excellent color, superior mouthfeel, no vegetative characteristics, desirable flavors, and importantly, an elusive quality that marketers call “cachet.” Cachet is a certain, unmeasurable aplomb that confers a special status or prestige on which to build a reputation. The Kearney wines are on the right track. "Many of the wines turned out better than we expected," Fidelibus said. "A lot of the reds had very good color, better color than some of the traditional varieties. Some of the whites hadhigh acidity,which is a good quality for the San Joaquin Valley because high temperatures tend to reduce acidity." At a recent tasting in Fresno, Kaye introduced winegrape growers and industry representatives to four wines made from grapes in the Kearney plot, Fiano, Biancu Gentile, Sagrantino, and Marselan Noir. Even though wine was produced in small lots and the winemaking process was not optimized, the wines have piqued the researchers’ interest. Fiano is a white wine with a fresh, young style evoking flavors of melon and grapefruit,” Kaye says. Marselan noir is a stylistically unique red wine with bright cherry flavor that pops. "In our internal tastings, these wines and several others showed some promise, but it is too early to know for sure,” Kaye concludes. "Constellation Wines will vet 20 to 30 varieties again in 2012. Some will be repeats. If we can eliminate half of the varieties that is progress as it will help us focus on the ones with greater potential for the San Joaquin Valley." Green and white row covers were installed on Redglobe table grape vines. 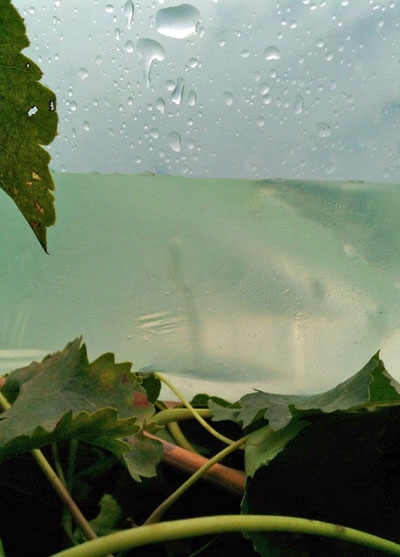 An early October rainstorm in the San Joaquin Valley provided UC viticulture specialist Matthew Fidelibus an ideal opportunity to evaluate the effectiveness of plastic vine covers for protecting late-season table grapes from inclement weather. Fidelibus, who is based at the Kearney Agricultural Research and Extension Center, installed the covers in September on a Redglobe vineyard near Easton. Some farmers choose to grow late season table grapes – such as Autumn King, Crimson Seedless and Redglobe – to market in the fall when prices are typically highest. However, they run a greater risk of being rained on. Exposure to moisture within six weeks of harvest can cause rots and molds to render the grapes worthless. 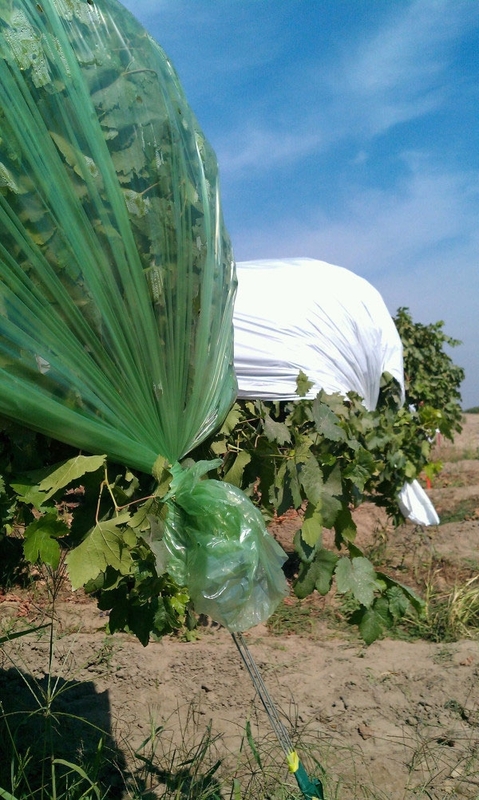 Many growers with late-season table grapes cover their vines with sheets of plastic film to protect them from rain. 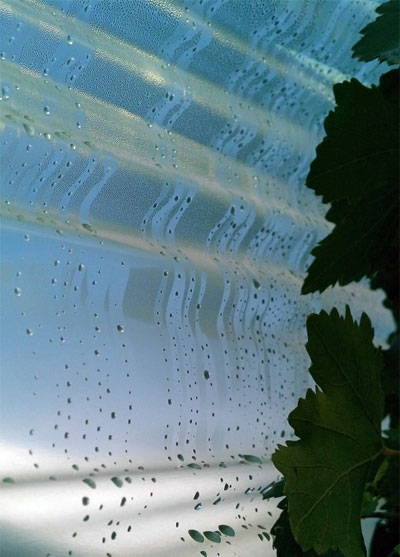 Growers may choose between a relatively transparent green film, or a more opaque white film, but data distinguishing the differences the two films might have on vine physiology or fruit quality at picking, or after storage, are not available. Buying, installing and removing the plastic is very expensive, so Fidelibus is working to provide growers with objective information about the effects of the different films. Growers can track the progress of the trial in real time by following Fidelibus’ Twitter feed, http://twitter.com/grapetweets. Water pooled on the vine cover during an early-October rainstorm. 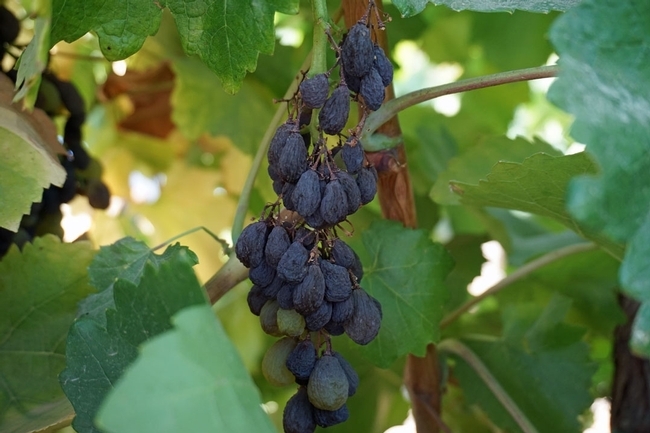 Five days after the trial was installed, a winter storm rolled into the San Joaquin Valley, dropping nearly an inch of rain on the table grape trial. As expected, the fruit on the covered vines stayed dry while the uncovered grapes were soaked, however, the covers posed some problems of their own. After the storm, the soil under the covered vines remained dry, but wind and sun quickly dried the grape clusters and soil around uncovered vines. Data loggers in the grapevine canopies are collecting temperature and humidity readings – measures that Fidelibus will use to help describe the effect of the different covers on the environment within the grapevine canopies. He also installed atmometers, special instruments that help determine the canopy’s “evaporative potential.” Research has already shown that the greater the evaporative potential, the lower the incidence of bunch rot. When it's not raining, condensation forms under the plastic.